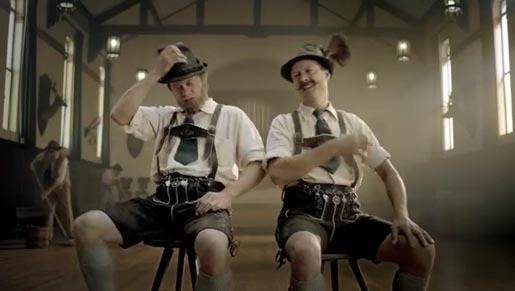 Uncle Toby’s is promoting a new deli range for Le Snak in Australia with “A Break with Tradition”, a television advertising campaign featuring two lederhosen clad German dancers. After tasting the new Le Snak Deli range on their break, realise they’ve been living in the past. With this new found realisation they decide to “modernise” their traditional Bavarian dance routine by incorporating Run D.M.C’s “It’s Tricky”, with rather amusing results. A break with tradition comes in spicy capsicum or tomato and basil. The Break with Tradition campaign was developed at Ogilvy Sydney by executive creative director Chris Ford, creative director Andrew Ostrom, creative group head Boris Garelja, copywriter Jono Paull, art director Henri Azzi, general manager Richard Carr, account director Aja Mitchell, account manager Jed McMillan, agency producer Gabe Hammond, working with Nestle head of marketing Lisa May, marketing manager Ian McFarland, senior brand manager Meca Andre, consumer insights manager Eloise Hall. Filming was shot by director Tim Bullock via Prodigy Films, Sydney, with executive producer Jonathan Samway, producer Serena Paull, director of photography Germain McMicking, and editor Adam Wills. Sound was produced by Simon Kane at Song Zu, Sydney.